second one at rear. Enable the smooth delivery of fabric and no congestion inside the delivery tube. option for high quality fabric process. high level dye ability and shorten dyeing cycle process. It can arrange the fabric left to right orderly into the fabric tank. Fully utilize the available space and avoid tangling. fabric and the water at the end of the delivery tube. This can avoid the fabric being messed up by the dye liquor. It will also avoid the fabric overcrowd situation and folding mark. 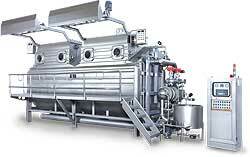 During dyeing process, the foam is automatically collected in the foam collector. Separates the fabric from the foam and avoid fabric floating, tangling and pollution problem. Low liquor ratio 1:5-7 save space and energy.